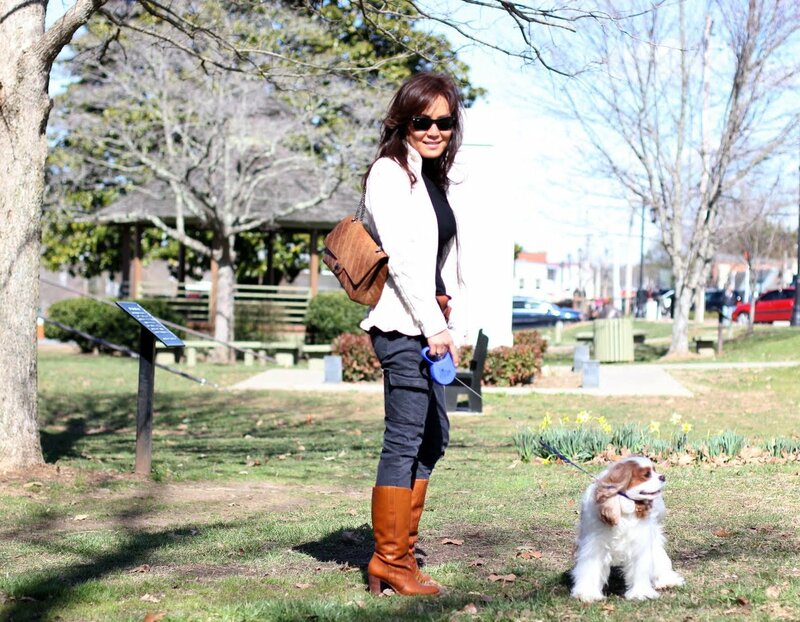 Tobi: A 6 year old Cavalier King Charles Spaniel ~ our 3rd child. We had to go out of town Saturday to take care of a few things. On our way out, we stopped to pick up some treats for Tobi at our favorite pet store. They carry human grade treats for dogs…hubby actually tried one and said it was delish. What we do for our fur-kid! Our Tobi HATES to be left alone. How do we know? Well, we’ve installed a camera to monitor him while we’re gone…he howls and cries for at least 15 minutes when we leave him…it’s so painful to watch. Hubby and I have actually discussed purchasing an RV for vacations so we wouldn’t have to leave him. Have we gone crazy? Do any of you feel this way about your pet? I’m linking up with Visible Monday and Monday Mingle. Check out the lovely ladies! Thank you so much for visiting, and have a wonderful week! I can totally identify! My husband becomes distressed at the thought of leaving our dog for more than a few hours! Ha! I’m so glad we’re not alone!! I feel silly sometimes feeling this way….but, hey, he is my kid! What an adorable dog. My dogs are spoiled so I’m definitely no expert but I’ve observed pet owners who have tried to accommodate separation anxiety by rarely separating from their dogs — and then separation becomes increasingly traumatic. I know people who can’t go on vacation because of their dogs! That seems undesirable…. I did have one dog with separation anxiety. He couldn’t come to work with me so he just had to live with it. He eventually improved on his own though I’m not sure that would be true for other dogs. Well, I think my anxiety is greater than his! I don’t cherish the thought of leaving him for more than a few hours. We’re really picky about who keeps him when we go away for vacations….usually a family member. I would still take him over a vacation…he brings that much joy to my life. Awwwww, your fur baby is such a cutie and you look gorgeous as always! Thank you so much Kristin! He’s snuggled next to me right now…he’s so cuddly! Tobi is adorable! Great pictures. Thank you!! I’m like a proud momma when it comes to him…this is what has become of my life after my kids have left home. That’s okay tho…Tobi never talks back and never asks for money! SO cute! I love black and brown together – my new favorite combo. Your blog is amazing – I hope you’ll consider joining our Chic Blogger Network! I appreciate your invitation to join your network…I’ll be sure to hop over and check it out. Tobi is sooooooooooo adorable and I love your outfit! 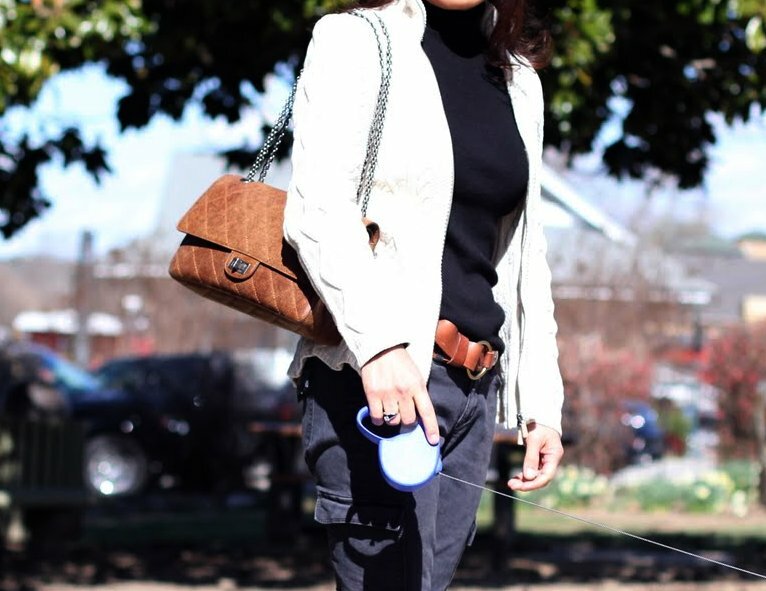 Casual but still very put together! I also nominated you for the versatile blogger award! Tobi is adorable if I say so myself! He’ll be SO happy to be reunited with his mom & dad! This is my PERFECT fall/winter oufit!! Nothing comes even close..White sweater, skinny jeans and riding boots!! You look gorgeous! And it’s so hard when you see your little furkid sad. 😦 I know what you mean – you would do anything for Tobi! You are so lucky that Tobi get to go to the office everyday! LOVE that Chanel and the matching boots! I knew you’d understand. He’s actually sleeping right now in my office….snoring! So cute! wowow, that dog piccy at the end of your post kinda takes one’s breath away. But, you should hear the owner talk about her dog…she loves him so much! What a handsome boy! And the outfit is terrific – reminds me that i need to buy more boots! Late season sales are underway! I know! He is a cutie! Yes, this is the best time to pick up winter/fall boots! I have two doggies and they love a lot of attention. That’s great you get to take Tobi to work with you, he’s adorable. Thank you Megan! You’re sweet! So lucky you can take your dog to work! That’s exactly what hubby said…I won’t repeat his exact words here tho. Yes, I am very fortunate to be able to take him to work with me. I can’t imagine leaving him alone all day. Okay, I am crazy! Is that a little ruffle on the bottom of your cardi? Yes, it does have a little bit of ruffles…can you call it a peplum sweater? You and Toby are pretty cute! I think most of us end up reworking our lives around pets…but there is nothing wrong with that…and who cares of someone thinks you are crazy! Toby thinks you are pretty great! I can tell that some people (family/friends) don’t quiet get our love affair with Tobi…heck, I don’t understand it. I just know what he gives me…an unconditional love! 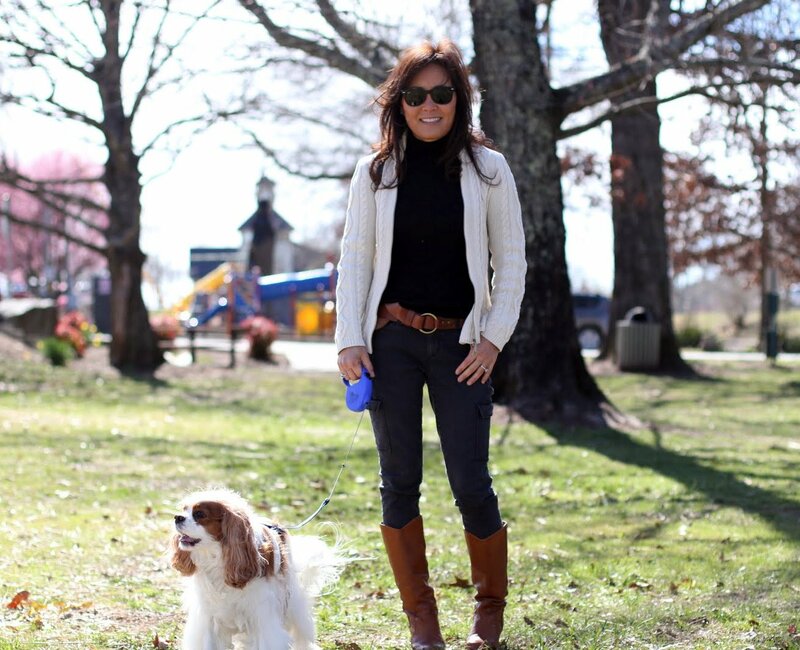 Love your easy casual chic here…those boots are FAB! I feel better that I’m not toooo crazy! 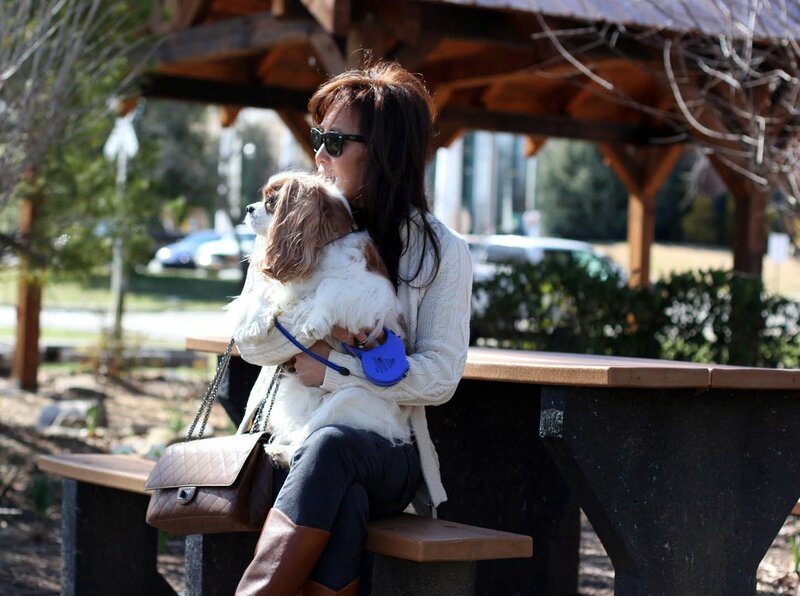 What a lucky dog to be so well loved and what a great looking outfit! The boots are fabulous! I think we’re pretty lucky to have Tobi in our lives right now…he’s filled the void left by our grown kids leaving home. He’s definitely a blessing! 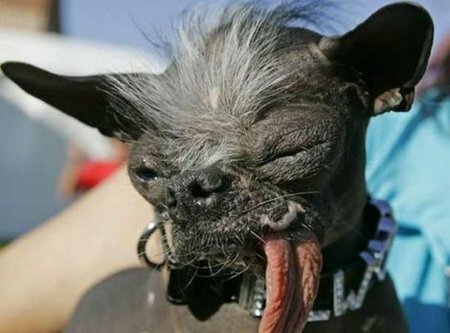 I actually find “the ugliest dog” adorable!! I’ve been wanting a Chinese Crested for the longest time – I find them hillariously cute! Think about it, if you’re having a bad day and you look at that little funny face, he’ll make you smile every time 😉 lol love your Tobi though! 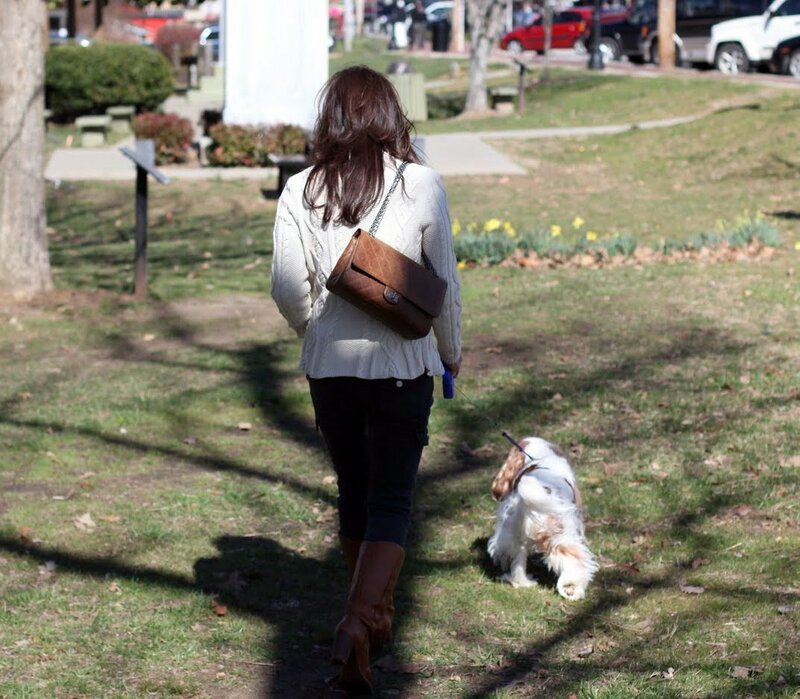 My husband and I both grew up with dogs – they’re certainly part of the family. Love love love them, I don’t blame you guys for thinking of getting an RV! I could never watch footage of a puppy crying after we leave 😦 If i saw one, I’d probably never leave him at home LOL !! Love your Reissue btw 😉 Gorgeous color! He’s my stress reliever, a cuddle buddy, a happy companion, and a world’s best beggar! I can’t imagine my life without him. Thank you! I’m enjoying the brown reissue very much. Ohhh what a chic outfit! I used to think that black and red were the best colors for a classic quilted Chanel, but I love this brown bag! I think I’m a convert. This bag is a bday gift from hubby…I really love the color! The youthful style also feels great. Elegant at all times. Oooh, I’m not so good with fish…had them but I think I overfed them to death…sad. Oh by the way I love that look. And your purse and boots awesome! That is very normal ^_^ I have a mama hen pet I call her “Esther” she died because our neighbors dog went to our barn and massacre the tribe of chickens who live peacefully. I never cried to an animal but that time I did. I have a video with Esther talking to her and it is really cool I can’t bare to erase it and still get teary eyed. What did Ester do, when I get home even if I am still in the driveway she runs towards me, flapping her wings. When I am outside she follows me everywhere. When I talk to her she talk back. One time I asked her she had to go to the chicken coup it’s getting dark and she can lead the way, she just turned around and walk ahead of me until she is inside the chicken coup. I missed my chicken mama. So I don’t blame you if Tobi gets spoiled we like spoiling kids hahahahahahaha!! Oh my gosh! What a sad story…I’m sorry! I had no idea hens had such personality…like a dog?! Yes, we can relate to loving the furry ones! My husband also says to our kitties: I’m going to work to keep kibble in your bowl! You and Tobi both look gorgeous! And thanks for linking up to Visible Monday too! Tobi is sooo loving, and he brings us so much joy…wouldn’t know what to do without him. Love this casual outfit. You look great! As usual, you look amazing! Great outfit! I’m guessing this is Jordan? I’ll definitely give him an extra hug for you! You and Tobi are both beautiful! great outfit, on both you and tobi! my hubby told our fur babies he works hard to keep food in their stomachs and fur on their backs! Sweet little Tobi doesn’t understand why his people leave him behind, he wants to go too so he can feel the wind in his fur and smell things! Maybe he needs a little puppy friend to keep him company…..